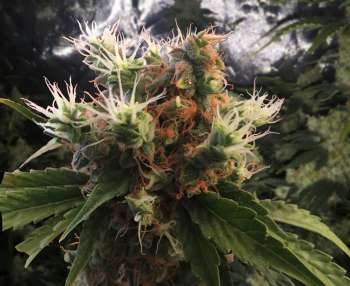 Here you can find a strain description about Medijuana and also some user-based reviews and infos directly from the SeedFinder (if available). You can also find the offers and auctions here if Medijuana cannabis seeds are on stock at MyCannapot right now. Medijuana, 100% all natural pain relief, is the most powerful medical cannabis seed strain worldwide. Medijuana, an indica dominant F2 hybrid (60% indica/40% sativa) is a strain of unknown heritage due to a high level of breeder secrecy, although it is thought to be an OG Kush descendant. She packs a classic flavor with sweet and spicy hints of herbs and pine and a slightly kushy aftertaste accented by sugary earth. The aroma is very sweet yet spicy with a woody earth overtone and a slightly dank pungency that is released as the nugs are burned. The THC levels reach up to 20-25% on average. It hits you first with a euphoric lift that boosts your mood and lulls your mind into hazy introspection with warming waves that spread throughout your entire body. Within minutes, you’ll be hopelessly stoned and completely couch-locked with no hope of moving any time soon. Medijuana is said to be perfect for treating experienced users suffering from conditions such as chronic stress or anxiety, insomnia, appetite loss, depression, and nausea. Flowering period is 8 to 9 weeks. Buy Medijuana now at MyCannapot! There are no actual running auctions for Medijuana right now.